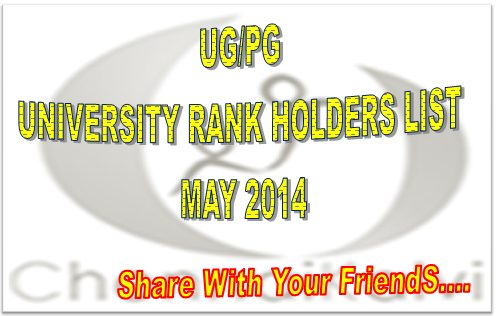 ANNA UNIVERSITY HAS PUBLISHED THE LIST OF PG RANK HOLDERS LIST OF MAY 2014 UNIVERSITY EXAMS.. List of PG / UG Rank Holders 2014 is Published. IMPORTANT NOTE : DETAILED RESULT ANALYSIS REPORTS ARE AVAILABLE IN THE FOLLOWING LINKS..